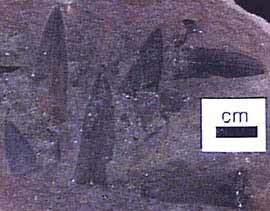 Stem Genera: Compression or impression fossils of Lepidodendron, Lepidophloios and Sigillaria show raised leaf bases (also known as leaf "cushions", Figure 5.8) with a small leaf scar at the apex of the elevated cushion. The cushion marks the point of attachment of abscised leaves. Within the leaf scar, you will see three other scars: The middle scar representing the leaf's vascular trace, flanked by two parichnos scars. Parichnos scars mark the position of parichnos tissue within the leaf and stem. Parichnos tissue is parenchyma with lots of air space between cells. This tissue probably aided photosynthetic gas exchange much like the lenticels of modern trees (e.g., Betula). Above the leaf scar, you should also note the position of the ligule, marked by a small pit (Figure 5.3). A number of genera and many species are distinguished by the shape of their leaf cushions: Lepidodendron has diamond-shaped cushions that are taller than they are wide, with the leaf attached at the upper end of the cushion (VG 2:1); Lepidophloios leaf cushions are also diamond-shaped, but they are wider than they are tall with the leaf attached at the lower end of the cushion (VG 2:2). Paralycopodites has leaf cushions that are intermediate in shape between Lepidodendron and Lepidophloios. 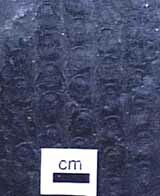 Sigillaria has square or rectangular leaf cushions arranged in vertical rows, with hexagonal leaf scars (VG 2:3). 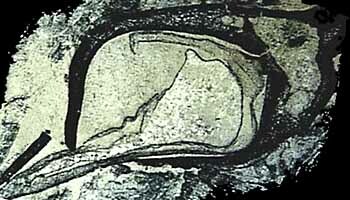 Bothrodendron leaf scars are faint or absent in external impressions. 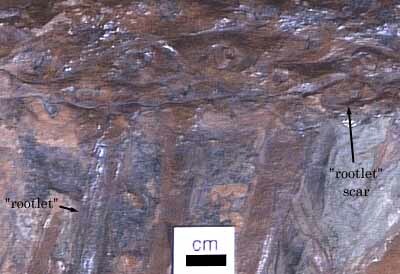 Figure 5.8: Leaf cushions in arborescent lycopsids. (A) Lepidodendron, (B) Lepidophloios, (C) Sigillaria. 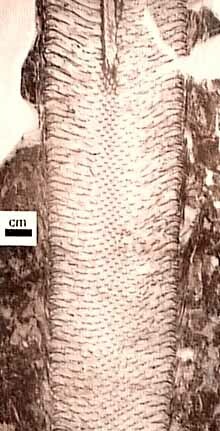 In anatomical cross section, the stem of Lepidodendron displays an exarch siphonostele surrounded by secondary xylem in ranks. 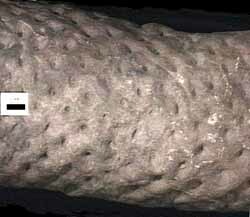 The evolution of secondary growth in the arborescent lycopsids is another synapomorphy for this clade. Note the position of parenchymous pith and ground tissue, and the thick cortex composed of sclarenchymized cells. Leaves: The leaves of arborescent lycopsids come in two sizes: Short, thick scale-like leaves (VG 2:5), and slender grass-like leaves up to one meter long (VG 2:4). The grass-like leaves are commonly found as dispersed organs, while the scale-like leaves commonly are preserved attached to their axes. Both types are known as Lepidophylloides, although the name refers primarily to the dispersed grass-like leaves. Most of the genera appear to have produced both sizes of leaves. 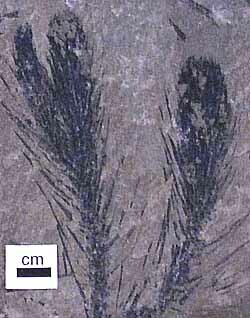 However, the grass-like leaves were mostly associated with juvenile, unbranched individuals, where scale-like leaves grew on branches after branching had begun. Reproductive Structures: Examine compressions and coal ball peels of Lepidocarpon (megasporangiate cone) and Lepidostrobus (microsporangiate or bisporangiate cone). Sporangia (some with spores still visible inside!) are born on modified leaves called sporangiophores (VG 2:6). In Lepidocarpon (Figure 5.9) (VG 2:7), the megasporangium is surrounded by the sporangiophore, which has grown to almost completely enclose the sporangium. This should remind you of a seed-plant ovule. These are not ovules, but clearly members of the Lepidodendrales were moving toward the "seed habit" by (1) developing heterospory, (2) reducing the number of megaspores to one, and (3) beginning to surround their megasporangia in a protective layer of tissue. In the case of the arborescent lycopsids, free-sporing heterospory clearly precedes the endosporic condition and enclosure of the megasporangium in sporophytic tissue. Keep this pattern in mind when we consider the evolution of similar structures in the seed plant lineage. Figure 5.9: Lepidodcarpon, a single sprophyll (Lepidostrobophyllum) with a megasporagnium. Note that the megasporangium is almost completely enclosed in a layer of sporophytic tissue. W.A. DiMichele has argued that free-sporing heterospory will only be favored in swamp environments, where gametes can move easily between unisexual gametophytes. Because many arborescent lycopsids, particularly those in which seed-like reproduction evolved, were swamp plants, free-sporing heterospory might be a viable evolutionary intermediate in this, but not other, lineages that enclose their megagametophytes and transfer microgametophytes. Microspores and Microsporangia: The microspores of Lepidodendron and Lepidophloios were the dispersed spore genus Lycospora. Lycospora spores are trilete and zonate. These spores are good biostratigraphic markers for the Pennsylvanian and are common in palynological preparations of that age. Strobili bearing microspores are called Lepidostrobus (VG 2:8)(VG 2:9); the name Flemingites has been proposed for cones containing both microspores and megaspores. Megaspores and Megasporangia: Dispersed megaspores (VG 2:10) of the arborescent lycopsids commonly go by the name Cystosporites, but there are other names as well. Cones that produce only megaspores are called Lepidocarpon; Bothrodendrostrobus, Caudatocorpus and Porostrobus are less common forms. Some of these forms produce endosporic megaspores and embryos have been recovered from within. Diane M. Erwin, U.C. Museum of Paleontology Paleobotany Collections Manager, and her colleague Gar Rothwell described some key material that led to the interpretation that arborescent lycopsids had not evolved bipolar embryo independently. 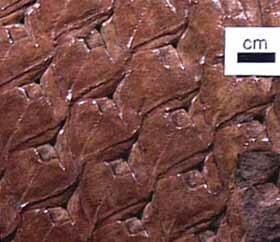 Rather, the arborescent lycopsids solved the problem of growth in two directions by bifurcating their embryo apical meristem at a very early stage of development. This also accounts for the anatomical and morphological similarity between above-ground shoot and stigmarian system. 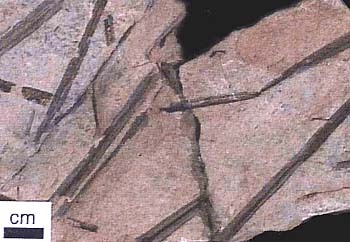 Rhizophores: Rooting structures (rhizomes or rhizophores) in the Lepidodendrales are known as Stigmaria (Figure 5.7) (VG 2:11). 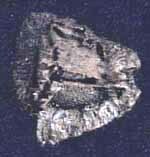 Casts and molds of Stigmaria (VG 2:12) are common in the under clay of coal seams and the roots they bear are ubiquitous in coal balls. "Rootlets" are borne in a spiral on the underground rhizome. Note rootlet scars and vascular trace in casts of Stigmaria. Examine a transverse section through Stigmaria (VG 2:13). 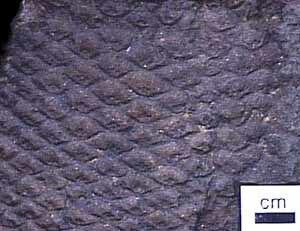 Note the endarch siphonostele, the position of pith, and secondary xylem that is separated into wedges by broad rays. 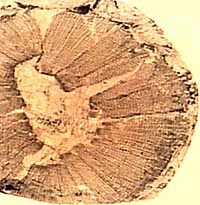 Anatomy and morphology of Stigmaria has been homologized with stem structures (Rothwell and Erwin, 1985), which leads to the interpretation that the shoot meristem in arborescent lycopsids bifurcates early in development. This differs from the bipolar development of seed-plant embryos and means that it is technically inappropriate to call Stigmaria a "root" or its appendages "rootlets" because they are anatomically, morphologically and developmentally distinct from underground structures of seed plants. Some have also argued that the stigmarian system photosynthesized and was metabolically independent of the above-ground shoot. This interpretation is based on the observation that there is no clear phloem connection between the shoot and stigmarian system. This idea is not without precedent among modern sister taxa: Some Isoetes lack stomata on their above-water leaves, gathering and fixing carbon dioxide from the sediment instead. Lycopsids developed the arborescent habit independently of and in very different ways than members of the euphyllophyte clade (e.g., progymnosperms, conifers, ferns, sphenopsids, and angiosperms). Yet evidence for convergence in a variety of structures abounds, especially between the arborescent lycopsids and seed plants. Both produce a cambium and secondary xylem (though the cambium is bifacial in seed plants and unifacial in lycopsids). Both developed leaves that served as the major light-gathering structures (microphylls in lycopsids, megaphylls in seed plants); these leaves were equipped with stomata, epidermis, and cuticle in both groups (however, these are plesiomorphies not convergences). Both groups produce reinforced periderm from a cork cambium. Both elaborate on similar styles of branching. Parichnos tissue in lycopsids has analogy with the lenticels of some angiosperms. There are also similarities in form, and to a lesser extent function, between the megasporophylls of Lepidocarpon and Achlamydocarpon and the ovules of gymnosperms. DiMichele (1981) speculated that most speciation in arborescent lycopsids took place outside what he considered to be the evolutionary refugia of the coal swamps. Since lycopsids today are represented only by herbaceous species, all arborescent lycopsids were ultimately "unsuccessful". (Although could you really call a group that dominated major habitats for 40 million years "unsuccessful"?) What characteristics of the lycopsid design and reproductive cycle would you think contributed to this group's lack of continued success, given the physiological problems of climatic change and the ecological problems of seed plant competitors?